Given names: Catherine Grace "Cady" Dmitri Yuriyevich Paolo Angelo Sergei Aleksandrovich Oleg Dmitriyevich Ronald John, Jr. Launch from the Baikonur Cosmodrome (Aleksandr Kaleri, Oleg Skripochka and Scott Kelly with Soyuz TMA-01M). 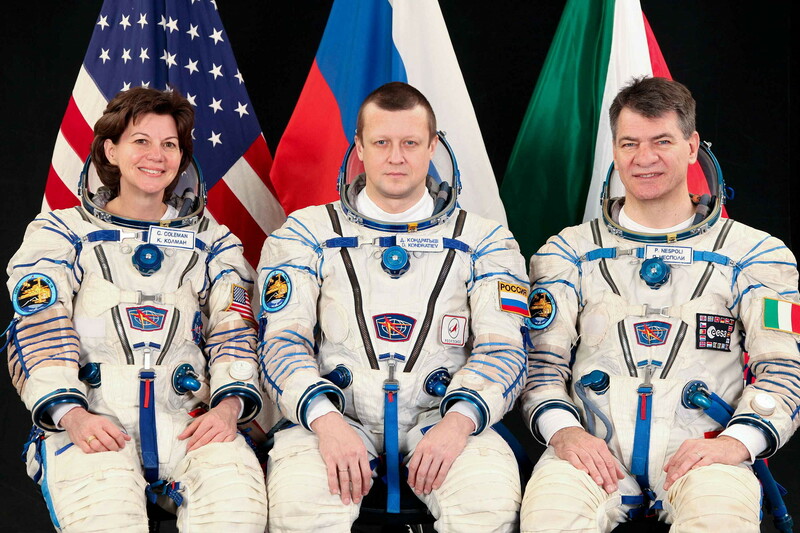 Fyodor Yurchikhin, Shannon Walker and Douglas Wheelock were onboard since June 17, 2010 (arrival with Soyuz TMA-19). ISS Expedition 25 began with the undocking of spacecraft Soyuz TMA-18 on September 25, 2010 at 02:02:12 UTC. 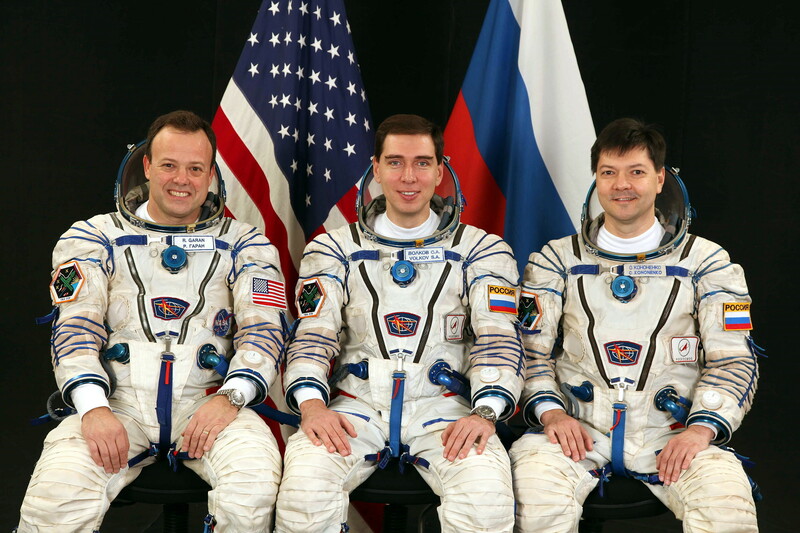 The former Expedition 24 (Aleksandr Skvortsov, Mikhail Korniyenko and Tracy Caldwell-Dyson) returned safely to Earth. 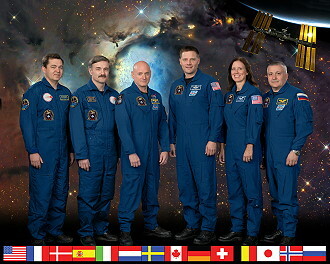 With the arrival of Soyuz TMA-01M on October 10, 2010 at 00:01 UTC the Expedition 25 became a six-person-crew. Soyuz TMA-01M carried Aleksandr Kaleri, Oleg Skripochka and Scott Kelly to the space station. The Russian resupply spacecraft Progress M-05M, which came to the station in May 2010, was undocked on October 25, 2010 to make room for another resupply spacecraft - Progress M-08M. On October 26, 2010, the space station performed a Debris Avoidance Maneuver (DAM) in order to get out of the way of a piece of debris from the defunct Upper Atmosphere Research Satellite (UARS). Progress M-08M was launched from the Baikonur Cosmodrome's Pad 1 (Gagarin's launch pad) at 15:11:50 UTC on October 27, 2010. 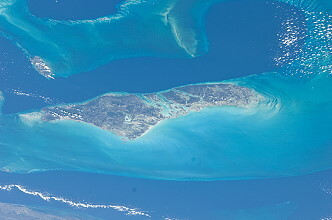 On October 30, 2010 after three days of autonomous flight following the launch, Progress M-08M docked with the Pirs Docking Compartment Module nadir port of the space station. The successful linkup came at 16:36 UTC while flying 220 miles (354 km) over western Kazakhstan. In preparation for the docking on October 20, 2010, the engines of the Progress M-07M spacecraft were fired for 228.7 seconds. 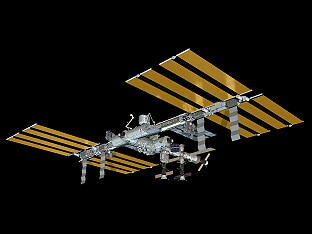 This reboost placed the space station at the proper altitude to receive Progress M-08M. 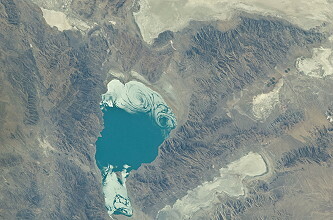 A late DAM performed on October 26, 2010 sightly changed the station's orientation in space and the planned docking had to be brought forward by a couple of minutes. The Progress M-08M spacecraft, flying on autopilot, performed a flawless rendezvous with the space station. After arriving in the vicinity of the space station, Progress M-08M began a flyaround maneuver to get lined up with the docking port and then executed a roll maneuver to properly orient its solar wings with surrounding structures around the Pirs module. A brief stationkeeping hold with about 650 feet (198.1 meters) between the spacecraft and space station allowed Russian flight controllers to assess systems before giving approval to commence the final approach. 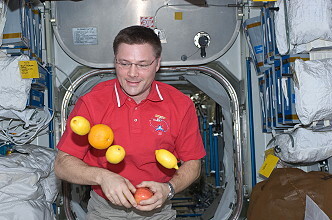 During stationkeeping, flight controllers in Moscow instructed cosmonaut Aleksandr Kaleri to activate the TORU manual docking equipment and take over the piloting tasks from the Progress' autonomous KURS system. The switch to manual mode was decided at range of 194 m. Aleksandr Kaleri worked inside the space station's Zvezda module to fly Progress M-08M remotely using television views and a pair of joysticks and guided it to the successful docking. 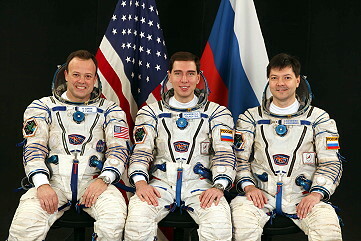 The range rate at the time of contact, based on Mission Control Center-Moscow calculations was 0.067 m/s. Progress M-08M hauled about 2.5 tons of cargo supplies including water, air, fuel and hardware for Molniya-Gamma and Coulomb Crystal experiments to the space station. The Molniya-Gamma experiment measures gamma splashes and optical radiation during terrestrial lightning and thunder conditions. The spacecraft also carried high-speed data transmission equipment to be installed on the outer surface of the space station during a spacewalk by cosmonauts Oleg Skripochka and Dmitri Kondratiyev in January 2011. In addition to the standard rations, the food boxes contain fresh fruits and vegetables - lemons, apples, onions, tomatoes, and 1 kg of garlic. Progress M-08M spacecraft undocked nominally from the International Space Station on January 23, 2011. 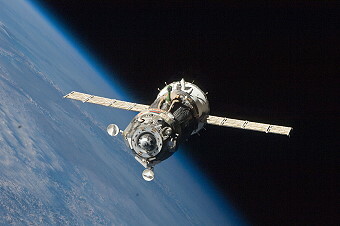 The undocking command was issued by Russian Mission Control at 00:40 UTC. The spacecraft was not used for further scientific experiments. The deorbit burn took place at 05:16 UTC on January 24, 2011. 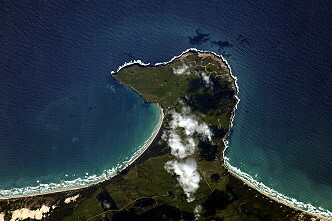 It re-entered and fell into a remote area of the southern Pacific Ocean at 06:07 UTC. Space Shuttle Discovery on STS-133 mission was scheduled to arrive at the ISS on November 03, 2010 but was re-scheduled for launch on February 03, 2011. The 10th anniversary of human life, work and research on the ISS fell during Expedition 25. 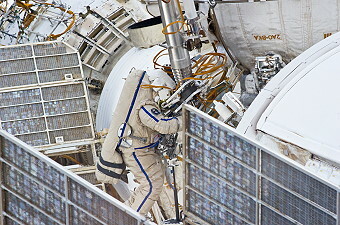 The only EVA in this expedition was performed by Fyodor Yurchikhin and Oleg Skripochka on November 15, 2010 (6h 27m) to install a multipurpose workstation on the starboard side of the Zvezda service modules large-diameter section, clean thermal insulation around the vents for the Elektron oxygen-generation system and relocate a television camera from one end of the Rassvet docking compartment to the other (failed due to interference with insulation where it was to be installed). 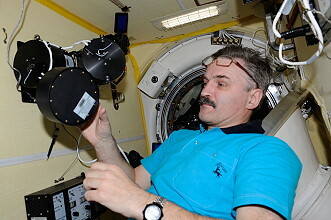 Fyodor Yurchikhin and Oleg Skripochka installed a portable multipurpose workstation in Plane IV in the Zvezda large diameter and installed struts between Poisk module and Zvezda module and Poisk module and Zarya module. They performed an experiment called Test, which was aimed at verifying the existence of micro organisms or contamination underneath insulation on the Russian segment of the ISS. Fyodor Yurchikhin and Oleg Skripochka photographed and installed the protective cover and disconnected and removed the Plasma Pulse Injector Science hardware from the portable multipurpose workstation in Plane II of the Zvezda. They cleaned the Kontur science hardware (ROKVISS) with dry towels and then disconnected and then removed it. Fyodor Yurchikhin and Oleg Skripochka also installed the protective cover and disconnected and removed the Expose-R scientific experiment from the portable multipurpose workstation in Plane II of the Zvezda module. The Kontur experiment studied remote object control capability for robotic arms and the Expose-R experiment is a European Space Agency experiment designed to expose organic material to the extreme environment of space. Fyodor Yurchikhin and Oleg Skripochka installed an oft hand-rail on Pirs docking module and installed the SKK #1-M2 cassette on Poisk module. The cosmonauts also removed a television camera from the Rassvet module, however they were unsuccessful in relocating the camera due to interference with insulation where it was to be installed. The Expeditions 25 / 26 crews worked with some 115 experiments involving approximately 380 researchers across a variety of fields, including human life sciences, physical sciences and Earth observation, and conduct technology demonstrations ranging from recycling to robotics. 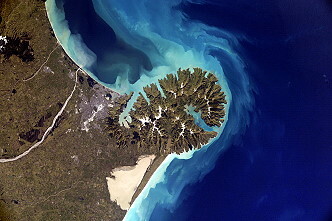 Seventy-two of these experiments were sponsored by U.S. investigators, including 18 under the auspices of the U.S. National Laboratory program, and 43 sponsored by international partner investigators - the Canadian Space Agency (CSA), the European Space Agency (ESA) and the Japan Aerospace and Exploration Agency (JAXA). More than 680 hours of research are planned. 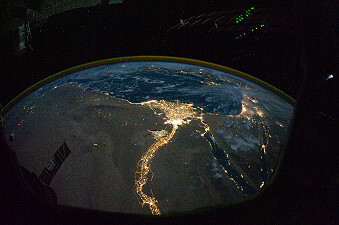 A suite of experiments organized by the Russian Federal Space Agency (RSA), Roscosmos, were also planned. The arrival of the Permanent Multipurpose Facility, an Italian-built converted pressurized cargo carrier named Leonardo, added 2,700 cubic feet (76.5 cubic meters) of pressurized volume to the orbiting laboratory, increasing the total habitable volume of the station to 13,846 cubic feet (392.1 cubic meters). Robonaut 2 was installed in the U.S. Destiny Laboratory, providing scientists and engineers on the ground and crews on the station an opportunity to test how humans and human-like robots can work shoulder to shoulder in microgravity. Once this has been demonstrated inside the station, software upgrades and lower bodies can be added, potentially allowing Robonaut 2 to move around inside the station and eventually work outside in the vacuum of space. This will help NASA understand robotic capabilities for future deep space missions. Two new science facilities were delivered to the station for use in a variety of investigations: the Boiling Experiment Facility (BXF), which will support microgravity experiments on the heat transfer and vapor removal processes in boiling, and the eighth Expedite the Processing of Experiments to Space Station (EXPRESS) rack, which will be installed in the Destiny Laboratory module. The new boiling research apparatus will support the Microheater Array Boiling Experiment and the Nucleate Pool Boiling Experiment. Boiling efficiently removes large amounts of heat by generating vapor from liquid, and is used on Earth in electric power plants, electronic cooling and purification, and separation of chemical mixtures. For boiling to become an effective method for cooling in space, scientists need to determine the critical heat flux, the point at which the heater is covered with so much vapor that liquid supply to the heater decreases. A Japanese experiment that uses cucumbers, called Dynamism of Auxin Efflux Facilitators Responsible for Gravity-regulated Growth and Development in Cucumber (CsPINs), was continued to expand the body of knowledge on how plants react to the microgravity environment since growing plants for food and oxygen generation is expected to be an important factor for long-duration missions to distant space destinations. As with prior expeditions, many experiments are designed to gather information about the effects of long-duration spaceflight on the human body, which will help us understand complicated processes such as immune systems while planning for future exploration missions. The investigations cover human research, biological and physical sciences, technology development, Earth observation and education. In the past, assembly and maintenance activities have dominated the available time for crew work. But as completion of the orbiting laboratory nears, additional facilities and the crew members to operate them is enabling a measured increase in time devoted to research as a national and multi-national laboratory. Also on tap in the area of technology demonstration is the resumption of work with a recycling device known as Sabatier, designed to help wring additional water from excess hydrogen not yet being reclaimed by the station's water recovery system. 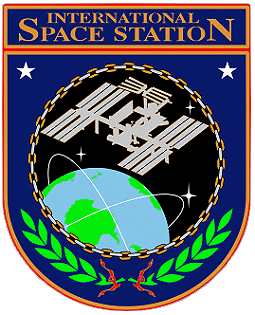 Managing the international laboratory's scientific assets, as well as the time and space required to accommodate experiments and programs from a host of private, commercial, industry and government agencies nationwide, makes the job of coordinating space station research critical. Teams of controllers and scientists on the ground continuously plan, monitor and remotely operate experiments from control centers around the globe. Controllers staff payload operations centers around the world, effectively providing for researchers and the station crew around the clock, seven days a week. Alpha Magnetic Spectrometer - 02 (AMS-02) seeks to understand fundamental issues on the origin and structure of the universe. NanoRacks-CubeLabs is a multipurpose research facility aboard the International Space Station which supports NanoRacks-CubeLabs modules by providing power and data transfer capabilities to operate investigations in microgravity. Photosynth Three-Dimensional Modeling of ISS Interior and Exterior (Photosynth) will synthesize threedimensional models of the International Space Station from a series of overlapping still photographs mainly as a tool for education and public outreach. 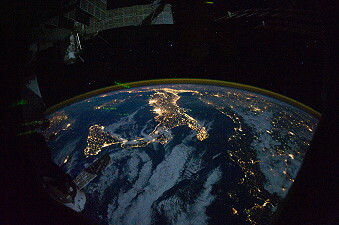 Photosynth is a collaboration between the National Aeronautics and Space Administration and the Microsoft Live Labs. Bisphosphonates as a Countermeasure to Space Flight Induced Bone Loss (Bisphosphonates) will determine whether antiresorptive agents which help reduce bone loss, in conjunction with the routine in-flight exercise program, will protect station crew members from the regional decreases in bone mineral density documented on previous station missions. Physiological Factors Contributing to Changes in Postflight Functional Performance (Functional Task Test) will test astronauts on an integrated suite of functional and physiological tests before and after short and long-duration spaceflight. The study will identify critical mission tasks that may be impacted, map physiological changes to alterations in physical performance and aid in the design of countermeasures that specifically target the physiological systems responsible for impaired functional performance. IntraVenous Fluid GENeration for Exploration Missions (IVGEN) will demonstrate the capability to purify water to the standards required for intravenous administration, then mix the water with salt crystals to produce normal saline. This hardware is a prototype that will allow flight surgeons more options to treat ill or injured crew members during future long-duration exploration missions. Burning and Suppression of Solids (BASS) will test the hypothesis that materials in microgravity burn as well, if not better, than the same material in normal gravity with other conditions, such as pressure, oxygen concentration and temperature, being identical. Investigating the Structure of Paramagnetic Aggregates from Colloidal Emulsions - 3 (InSPACE-3) will obtain data on magnetorheological fluids - fluids that change properties in response to magnetic fields - that can be used to improve or develop new brake systems for vehicles and robotics. Structure and Liftoff In Combustion Experiment (SLICE) investigates the structure of lifting and lifted flames; whereby the flame detaches from the nozzle and stabilizes at a downstream position. Results from this investigation are used to maximize the science return from the future Coflow Laminar Diffusion Flame Experiment. The objective of DOBIES is to develop a standard dosimetric method to measure absorbed and equivalent doses for biological samples as a contribution to the DOSIS experiment, and EXPOSE-E (completed) and EXPOSE-R payloads. ESA GREEN-HOUSE is an education project where the concept of fresh food production in space will be related to the biology and science curriculums of 12 -14 year olds through film and ISS live link activities. Geoflow-2 investigates the flow of an incompressible viscous fluid held between two concentric spheres rotating about a common axis as a representation of a planet. This is of importance for astro-physical and geophysical problems. MICAST carries out research into the formation of microstructures during the solidification of metallic alloys under diffusive and magnetically controlled convective conditions. Marangoni EXP is an experiment of Marangoni convection led by Koichi Nishino of Yokohama National University, and performed using the Fluid Physics Experiment Facility (FPEF) in the RYUTAI rack in Kibo. Within a silicone oil liquid bridge formed into a pair of disks, convection is induced by imposing a temperature difference between the disks. The flow and temperature fields in each stage (e.g., steady, oscillatory, and chaotic flow) are observed using several visualization techniques to determine the transition process. The experiment data and images are downlinked in real time and also recorded for detailed analysis. 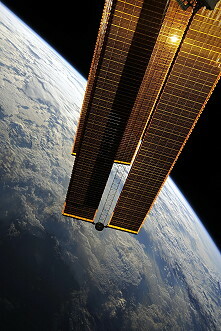 The experiment cell of this experiment was delivered to the ISS on the HTV-1 Mission. Facet is an experiment to investigate phenomena at the solid-liquid interface for facet-like crystallization that are considered to be strongly influenced by the temperature and concentration distributions in the liquid phase. The in-situ observation of both concentration and temperature diffusion fields with a two-wavelength interferometer will be performed for facet-like crystallization using transparent organic materials under microgravity conditions, a convection-free environment. The Facet Cell 1 was installed in the Solution Crystallization Observation Facility (SCOF) in the RYUTAI rack. After completing the first set of experiments with Facet Cell 1, a crew member changed the direction of the facet cell so that more experiments using Facet Cell 2 can be performed. Hicari experiment aims to verify the crystal-growth theory, and to produce high-quality crystals of SiGe semiconductor, and performed using the Gradient Heating Furnace (GHF). The experimental cartridge containing SiGe samples is heated at the planned temperature profile in the GHF. After the cartridges are set in GHF, the experiment will be conducted by ground operations. The cartridges of this experiment will be delivered to Kibo, ISS on HTV-2. Nanoskeleton2 will quantitatively evaluate gravitational effects on a new nanomaterial during its chemical reaction process. The nanoskeleton, a coined word that is defined as a functional nanoframework, is expected to be a highly functional material because of its high surface area. The high surface area is due to the pore structure and functionality of the framework itself. The TiO2 nanoskeleton, especially, has potential as a high-performance photocatalyst and highly efficient dye-sensitized solar cell. The TiO2 nanoskeleton is synthesized from a mixture of CTAB surfactant solution and TiOSO4-H2SO4 solution at 40 degreesC or 3 days under isothermal conditions. The nanoskeleton experiment will be performed using the CBEF in the SAIBO rack. Oil will be used to enlarge the pore size of the honeycomb structure of the TiO2 nanoskeleton so that flotation of the oil can be suppressed in microgravity. All of the experiment samples will be retrieved and evaluated on the ground. The retrieved samples will be evaluated to clarify convective flow, flotation, and sedimentation effects on the sample quality. During the experiment, temperature and downlinked images of the samples will be monitored. Results of this study may enable the synthesizing of nanoskeleton materials on a mass production scale, and eventually, commercial realization of nanoskeleton materials as photocatalytic particles and so on. This experiment will be performed under JAXA's ISS Applied Research Center promotion program, which is joint university/industry/government research. Rusalka: Testing of the procedure to determine the carbon dioxide and methane content in the Earth atmosphere to understand a role of natural processes in human activity. Finally the station command changed from US astronaut Douglas Wheelock to US astronaut Scott Kelly. 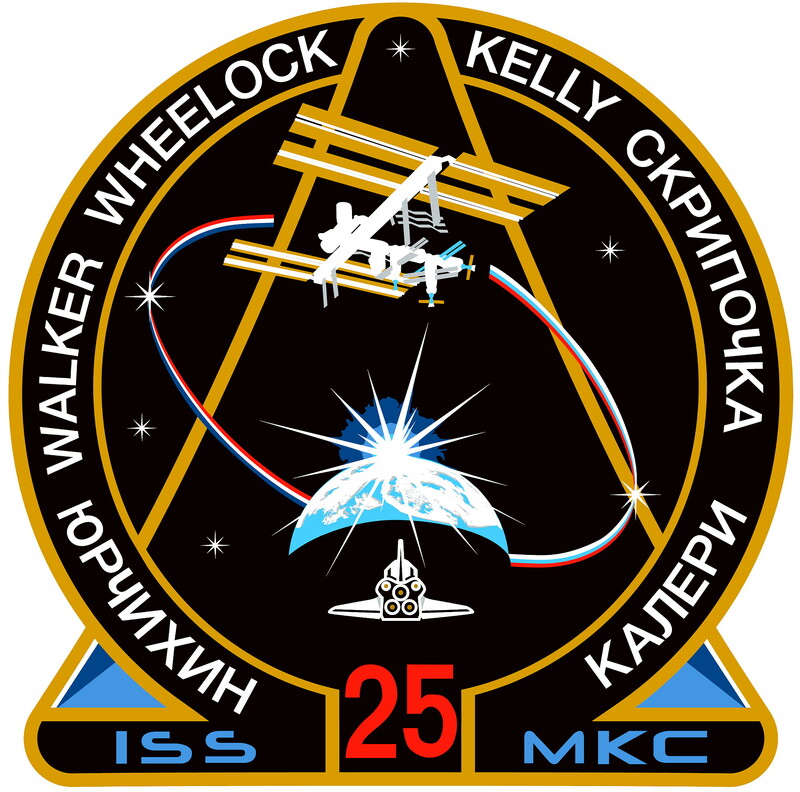 With undocking of Soyuz TMA-19, carrying Fyodor Yurchikhin, Shannon Walker and Douglas Wheelock on November 26, 2010 at 01:23 UTC the Expedition 25 concluded and the new ISS Expedition 26 began. Zag (Ambiguous Tilt and Translation Motion Cues After Space Flight). Last update on April 21, 2018.